I used tip # 2 for the icing strings, is 3 cakes. I used wood dolls to give the tiers some support. The cake sizes are 6", 4" and 8". Yes it is a mini cake. The flowers are fondant. I airbrushed it with pearl dust to give it some shine. The bow is also fondant mixed with gumpaste and I made it 1 week before. Home made cakes. 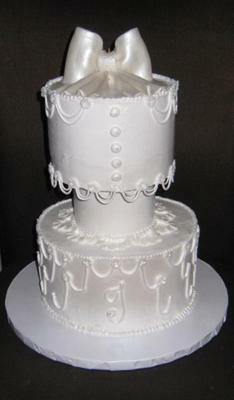 Cake orders should be place 2 weeks in advance to 1 month before your event.